Immersive music is necessary for a fun and enjoyable driving, but factory speakers never meet your demands. An aftermarket speaker is the most common resolution: better performance, more fidelity, and more loudness. After carefully researched, we made out this list of the 7 best 4×6 car speakers that you should consider when shopping for a replacement for your stock speakers. Does the size fit my car? Does more power mean better performance? Generally, the more power the speaker is, the better the sound is. Therefore, we start out the list of the best 4×6 speaker with the most powerful one: Rockville RV46.3A. At first glance, this pair of speakers has out-of-the-space power handling capacities. The RMS power handling is 70 watts while the peak power handling is capped at 500 watts. These are amazing for just a pair of car speakers. But another amazing thing is the sensitivity rating: 90 dB @ 2.83V. This means the speaker will make the most of every watt of power to create a loud and overwhelming music immersion. Playing music with such strong power for a long period as you’re driving is easy to cause overheating. It’s not much a problem for this Rockville model. It’s made of durable PEI material, which has superior temperature resistance. It’s to extend the lifespan of the device and preserve the sound quality. The speaker cone uses a ferrite magnet, pair with a flex motion butyl rubber surround to absorb as much distortion as possible, making the sound nice and clean. Rockville also applies their exclusive technology to crease fidelity in the output sound. Different drivers inside the speaker excel at reproducing the sound of a certain range of frequencies. So, this pair of speakers uses a crossover to deliver a particular range of frequencies to the more suitable sound driver. The result is a higher fidelity and wider dispersion of music. Pioneer is one of the oldest corporation in the audio electronics industry, their products never disappoint us in terms of quality and reliability. This Pioneer speaker set is among the A series, it inherits the company’s exclusive techniques: Multilayer Mica Matrix Cone and Lightweight Elastic Polymer Surround. The product can easily perform any high-frequency signals because its cone is made thinner than other comparable models in the market. But the cone is still tough enough to diminish as many vibrations as possible. It is also sustainable, lightweight rubber surrounds to protect the cone from shaking and damaging its parts. Each one of the speaker pairs has 30 watts nominal RMS power handling and can reach a peak at 200 watts. As a pair, it is 60 watts and 400 watts respectively. This is a top-notch amount that is rarely available in most of 4 by 6 speakers. Moreover, the product also has a 3-way design. This means it can reproduce all sound frequencies in the gamut of human hearing. Every melody, whether it’s super low or extremely high, will be transferred correctly into your ears. Infinity is famous for elaborate high-end audio devices, only suits a very niche of customers. Therefore, every product from Infinity is one of the highest performance in the category. And this Kappa 64cfx competes for a leading position of the best 4×6 speakers in the market, too. The power handling capacities of this Kappa speaker set are rated at 120 watts (RMS) and 360 (peak). This is great for a pair of 4×6 speakers, in fact, it’s only a little less than the top 2 powerful speakers. But the most surprising thing is, uniquely, the insanely low impedance. With the total impedance of 2,5 ohms, the actual power goes into the speakers is a lot stronger. You must choose an amplifier of which maximum output power is twice bigger than the peak power rating of this speaker. Less powerful amps won’t be able to drive the speakers. Moreover, this speaker set has the sensitivity @ 2.83 Hz is 94 dB. It is the highest record among our researched products, as well as exceptional for 4×6 car speakers. In terms of design, Infinity uses the most advanced technologies to produce an outstanding, elaborate pair of speakers. Patented Plus One woofers take responsibility for the deep and strong bass; while UniPivot Tweeter, dome tweeters with edge-driven textiles, deliver any highest frequencies. Surprisingly, the speaker is upgradable! It means that you can attach an additional mid-range driver to turn in into a 3-way speaker for a full-range sound experience. If there’s something negative about this model, it should be its sky-high cost. The product is sold at $140 for a pair, but if you want to upgrade them into 3-way speakers, you will, of course, need a little extra money. Polk Audio doesn’t set their focus on extremely high-end speakers as Infinity does, but this doesn’t mean their speakers lacks quality. This pair of Polk Audio DB462 speakers can take the load of 100 watts continuously and 300 watts at peak. It’s enough energy to fill up a car with lively and immersive music. This product is one of the average speakers with good bass and sharp highs. But more than expected, the speaker set is also as sensitive as top performance models: 90 dB. However, the most impressive aspect of this pair of car speakers is its design and structure. Polk Audio uses Rockville Rockmat RM2, the exclusive 100% butyl rubber surround to absorb the buzzes when the speaker cone vibrates. This results in a diminishing of 5-8 dB of unwanted noises and rattles. This is a much better performance in terms of sound dampening compared to other leading brands in the industry. Not only made for cars, but this DB462 speaker set also uses high durability materials, 100% ROHS Silicone & ABS, to exposure to extreme weather conditions. Polypropylene cone with Rockville Rockmat RM2 raises the speakers’ water-, UV- and dirt-resistance, creating a complete protection around them. You can comfortably attach the speakers to your motorcycles, or even your boat, to immerse in music everywhere and everywhen. Tough and durable to withstand any extreme conditions. 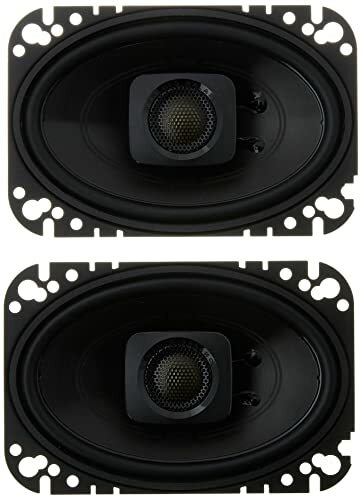 This Kicker KSC4604 speaker set is cheap and available to customers with any financial conditions. However, the product has unexpectedly good performance. It has above average power handling capacities: 150 watts RMS power handling and 300 watts peak power handling. Its sensitivity is rating at 88 dB @ 2.83V, which is still higher than some of the cheapest car 4 by 6 speakers. The speaker has a 2-way design, which means it lacks one sound driver producing medium frequencies signals. But this weakness is minimized thanks to “extended dynamic range” technology. Only two sound drivers can still cover almost all the lows, mids and highs. The fidelity of the output sound will be as close as of full-range, best 4×6 speakers. 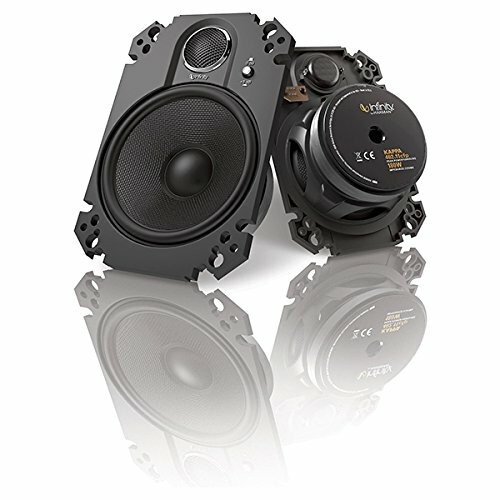 The silk dome tweeter can also drive smooth and exceptional highs for loud volume enthusiasts. Another good thing about this product is that it’s designed for easy installation in most models of GM cars and trucks. Thus you won’t be worried about wasting your money because of a couple of unfit speakers. Infinity 4×6 speakers Kappa series is for the niche and big-budget customers. If you want a more affordable Infinity product, take a look at the REF-6422cfx. 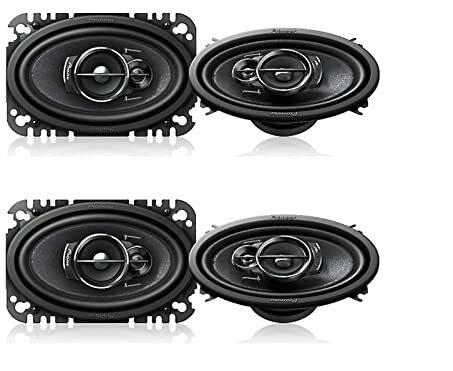 This coaxial speaker set has a reasonable RMS and peak power rating: 90 watts and 270 watts respectively. But as a member of the Reference X series, the speaker has a lower impedance than normal – only 3 ohms. Its sensitivity rating is also incredible: 92 dB @ 2.83V. Therefore, REF-6422cfx can reproduce a high-fidelity music that isn’t less impressive than other leading models of the best 4×6 speakers. Of course, REF-6422cfx inherits patented Plus One and UniPivot technologies as other Infinity models. But the Reference X series also has another exclusive, innovative technology called “True 4-ohm”. It means that even if the nominal impedance of the speaker is rated at 3-ohm, the total, final impedance of the speaker reaches 4-ohm. So, you can plug the speaker into a 4-ohm external amplifier without any concern about overloading. 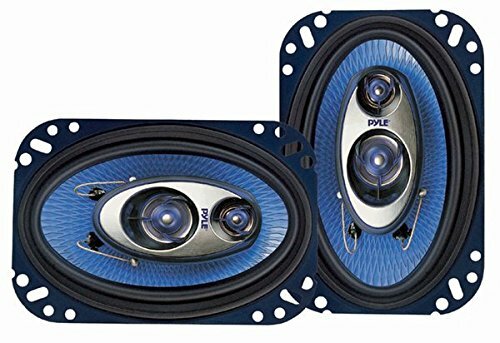 The last item on our list is a set of Pyle PL463BL 4×6” 3-way car speakers. Although it’s cheap, it’s not low quality. 68% of Amazon customers who bought it gave it above 4 stars and above ratings, meaning they felt it’s worthy and deserved to be in the list of the best 4×6 speakers. The most persuasive proof for this claim is 3-way design. None of the under $50 car speakers has a 3-way design, but this little Pyle PL463BL does. It contains a 1” neodymium film dome mid-range sound driver inside to deliver a more fidelity, quality music reproduction. In addition, the speaker contains a ¾” piezo tweeter to deliver signals of the highest frequencies for music enthusiasts. 1” ASV voice coil with rubber surrounds can withstand high temperature and shock, absorbing most vibrations and buzzes. It helps the output music clearer, as well as extend the speaker’s longevity. The power rating is also acceptable for a pair of cheap 4 by 6 speakers. Its RMS power handling is 120 watts, while the peak power handling is 240 watts. You may need an external amplifier to get a better performance. But, due to the low power load of the speakers, there will be a lot of amplifiers available. You are free to choose your favorite amp, as long as it matches the speaker’s impedance. No matter how powerful your speakers are, if they don’t fit your car, they’re useless. This is why you should have a comprehensive preparation before the actual purchasing. Firstly, you should know what the cut-out dimension of the speakers you should buy. Every car has some information points out which speaker’s sizes you need to use. If the height and width of the speakers overextend the hole in your car, you cannot install them. Or if the speakers are smaller than the hole, it won’t stay firmly and suffer from physical shock as you drive. Neither situations lead to money wasted and uncomfortable experiences. As you’re reading a guide of 4×6 speakers, your car must be able to attach speakers of 4-inch high and 6-inch wide. Other models can require 6×9, … or larger speakers. You need to look for this information right inside the hole, in the user manual or in manufacturer’s website. Still don’t know exactly? Abuse the customer services! Secondly, the mounting depth of the speakers is also very important. It is how long the speaker goes inside the body of the car. The speaker’s mounting depth should match the size of the mounting hole, a little smaller is acceptable but no bigger. You can’t keep the speaker stay firmly and the sound clear otherwise. 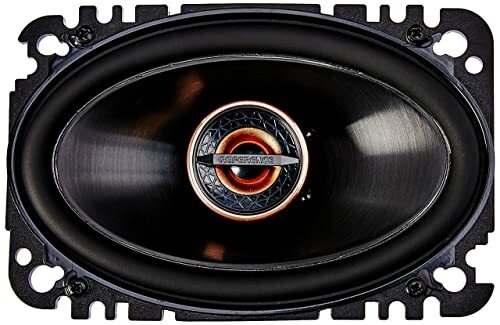 Speaker’s sizes often come in fixed presets that based on the cut-out diameter: for 4×6 speakers, the mounting depth varies from 44 to 50 mm (1-¾” to 2”). So basically you don’t need to worry much about this, whenever you choose the right cut-out diameter, your speakers will fit. But some vehicles and models are slightly different. Maybe it needs to be different to follow the unique design of the car. So, it’s not guilty to check the mounting depth of your mounting hole and speakers. It guarantees you don’t waste your money and other negative results when inserting unfit speakers into your vehicle. If you’re shopping online, you can use Amazon’s helpful feature: shop by vehicle. It is a dedicated tool to help drivers know whether the desired model perfectly fit their vehicle. You can define the exact model of your car, the brand who made it and even the year of production. The website will filter out the unavailable products, everything you see from then is informed to match your vehicle’s demands. Lastly, if you’re still not sure whether the desired speakers fit your car, ask the community. Customers who bought the same products will be likely to leave a comment for others to make a decision. You can easily find them in the review section of any online shopping sites or automotive groups and forums. This is the question, and the assumption, everyone bares in their head. Generally, the more power your speaker is, the better the sound is. But the real answer is: it depends! Speaker uses the energy to deliver sound to the environment outside. But sound loses its energy when being transferred through the air, so you need to turn the volume button up to listen to music in large spaces. Moreover, when you’re driving, there are a crazy amount of things that can interfere and absorb the energy of sound. Thus the speaker needs more and more energy to play louder and clearer sound. Therefore, a more powerful speaker performs better in noisy environments and is a thing that every driver aims for. There are two different specifications for a speaker’s power rating: the RMS (or Continuous) Power Handling and the Peak Power Handling. Having a thorough understanding of these two number will help you in choosing a perfect pair of speakers. Consider this example: a song has many parts, some are low and some are high, sometimes the singer whispers, but sometimes he yells it out. That says, at different frequencies of sound, the speaker needs a different amount of power to deal with. When performing extreme highs, the required energy may exceed the speaker’s power handling capacity, thus damaging the speaker. Continuous power handling indicates the average amount of energy the speaker uses to work well for a long, continuous period. In order word, continuous power handling is considered as nominal power. It means that you, most of the time, should choose speakers with a continuous power rating which goes near or exactly match that amount. Sometimes you can’t find any of the term “Continuous Power Handling” or “Continuous Power Rating” in your car and instructions. Rather than that, you see “RMS Power Handling” or “RMS Power Rating”. In terms of physics and electronics, these two terms refer to two different things. But the differences aren’t extreme and many manufacturers have used the two interchangeably to refer to the nominal power rating. So, you can use either “Continuous Power Handling” or “RMS Power Handling” as a criterion to choose a suitable pair of speakers. Opposite to the Continuous Power Rating, Peak Power Rating refers to the highest level of energy your device can handle. You’re not allowed to go beyond this limit, otherwise, your devices may fail to perform. But remember, the speakers can’t power itself. So, this isn’t the maximum power that a speaker can stand. In car audio system, speakers are always be powered by a head unit or amplifier. When speakers need more energy to reproduce higher frequency sound, they will pull more power from the head unit or amplifier. So more exactly, Peak Power Rating refers to the maximum amount of power your speakers can drive from the amplifier or head unit. You need to make sure the peak power handling capacity of your speakers match the highest power output of the head unit or amplifier or vice versa. Otherwise, your head unit/amplifier will be overloading and overheating, and eventually turn into failure or even damaging. Double check user manual for this kind of specification before completing any purchases. Power alone can’t make your speakers perform better. The energy is just transferred into more loudness, not the quality of the sound. If your device lacks the ability to deliver clear, high-fidelity sound, more input power will just turn it into louder rattles and buzzes. As a result, you need to pay attention to other factors that have more impact on the quality of the output sound. And this is the design of the speaker. The design, here in car speakers, is not how beautiful the appearance is. It’s the structure inside the speaker: the sound drivers. There are three types of sound driver: woofer, tweeter, and mid-range. A woofer is a sound driver that takes responsibility for making bass and low-frequency sounds. With a good woofer, you’re able to enjoy strong, deep and emotional super low frequencies notes that hit the bottom of your heart. And the last sound driver, the mid-range, covers what the previous two lacks: sound in the frequency range between 250 to 2000 Hz. Three sound drivers together cover all the range of audible sound, reproducing a high-fidelity music. If containing all the three drivers, a speaker is called full-range, or 3-way design. 3-way speakers are the ideal choices for any Hi-Fi audio systems and music enthusiasts. The woofer and tweeter are able to reproduce the sound of frequencies range that overlaps the range of a mid-range driver. So, some manufacturers remove the mid-range sound driver to create the 2-way speakers and loudspeakers. The main purpose is to reduce the cost and become more affordable for thousands of customers. This reduces the speaker’s performance as well, though not so significance for almost average customers. In summary, 2-way or 3-way speakers actually depend on your budget and desire for quality. A specification that is closely related to the power is the speaker’s sensitivity. Sensitivity refers to how good the speaker transfer one watt of power into loudness. You need to understand how sensitive work to be able to judge its significance. Let’s take this example: the Pioneer TS-A4676R above has the sensitivity rating of 88 dB. At one watt of power the amplifier/head drive into it, the speaker can deliver a signal of 88 dB. If you increase the power up 1 watt more, the speaker will only create 101 dB sound. It’s not a noticeable difference, most of the time you won’t be satisfied. The fact is every 3 dB needs another watt of power. So, if you want to immerse in a loud and lively music, you will need a lot of power. It’s when sensitivity comes to play. If you increase the sensitivity, every additional watt of power will transfer into more loudness. With the same input amount of power, the more sensitive speakers will play louder than the less sensitive ones. So, if you want to play louder but don’t want to put your speakers and amps in stress and overloading, look for a more sensitive pair of speakers. Another speaker’s specification that is important but always leads to confusion and misleadings is impedance. Technically, impedance is the resistance of a material over the current. Every kind of materials has different values of impedance. In audio electronics, impedance is set at fixed values for easy measurement and comparison. The most common values for impedance is 2, 4, 6 and 8 ohms. Every audio device, in this case is speaker and amplifier, has the power rating measured at those preset impedances. For example, a speaker description says the RMS Power Handling is 75 watts at 4 ohms impedance. This means at 4-ohm impedance, the amplifier can continuously drive the load of 75 watts. But the power will change if, somehow, the amplifier works at another impedance such as 2 or 6 ohms. You may ask a further question: when the impedance change? When you connect an external speaker at different impedance. Remember the fact that halving the impedance doubles the power. So if you attach a 2-ohm speaker into a 4-ohm amplifier, you will force your amp to double the power to drive the speaker. The result is likely to be overloading, overheat and even damaging the device. 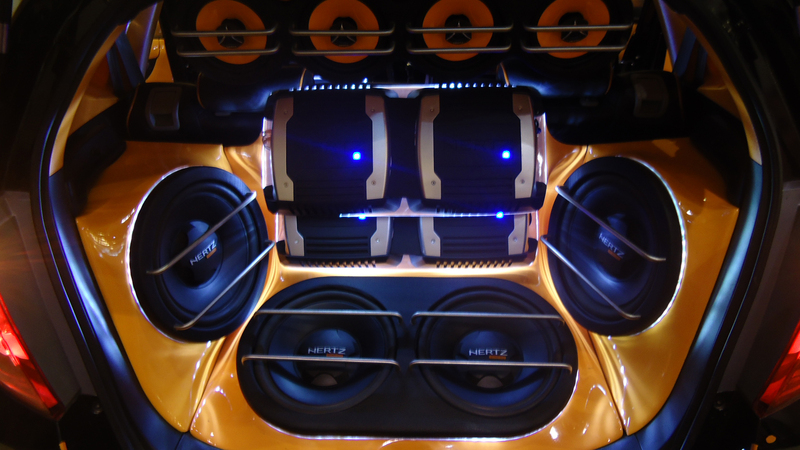 Therefore, pay attention to the impedance specification when choosing car speakers. The perfect advice is to match the impedance between your devices. It guarantees you don’t put any of them at stress so that they can last as long as possible. If not, it’s still OK to attach a higher impedance speaker onto a lower amplifier or head unit. It’s because you don’t need more power to drive the speakers, but you also can’t fully utilize your amp’s capabilities. But never connect a lower impedance speaker to a higher amplifier unless you have specialized knowledge and experienced, as well as being fully conscious and understanding what you are doing. Founded in 1968 by three creative American engineer Arnie Nudell, John Ulrick and Cary Christie, Infinity introduces some innovative technologies that changed modern audio devices industry, such as polypropylene cone, mylar diaphragms and EMIT system. In the early period, Infinity’s products are often high-end loudspeakers which cost thousands of dollars. Nowadays, they’ve become more closed to average consumers but still retain their quality. Infinity has become one of the most popular choices among American drivers and even becomes stock speakers in some models of Hyundai and Kia vehicles. Pioneer is one of the most famous speakers and audio devices Japanese brand. It’s founded in 1938 in Tokyo as a speaker repair shop and now has developed into a multinational corporation. The company works in almost businesses of electronics and high-end electronic devices. With the long and successful history, as well as a large professional group of experts, Pioneer always provides the best quality audio products. Another giant in the electronic audio industry is Polk Audio. Having no such a genius innovator as Fosgate, Polk Audio uses their forces to research and improve the quality of audio devices. Then, the results come in as natural: SDA, cascade crossover…are just two of hundreds of exclusive, patented technologies that introduces consumers the true Hi-Fi audio devices and standards. The most famous figure in the audio electronics world is James Fosgate: he invented the Punch EQ, the first car amplifier ever in the World. Then he founded Rockford Fosgate in 1973 to sell his innovations and other fabulous products. Therefore, the corporation always tries to apply the latest technology to reflect the true sounds of music to consumer’s ears. Another Japanese brand that is favorite by thousands of drivers and car-lovers in the world is JVCKenwood, a combination of Kenwood and JVC. JVC is a television and electronics Japanese giant, while Kenwood is well-known for robust and quality audio devices. The two companies form a corporation that offers high-end quality Hi-Fi car audio and home theater. With Japanese strict criteria, you can always trust JVCKenwood products about usability, performance, and longevity. Hope that with our reviews above, you can find the best 4×6 speakers for car to enjoy your favorite music during any trip.